Your discovery of the food tradition of Chania starts at 10.00 in the morning in front of the city's Cathedral which is called Trimartiri and is devoted to Virgin Mary, the patron saint of the city. 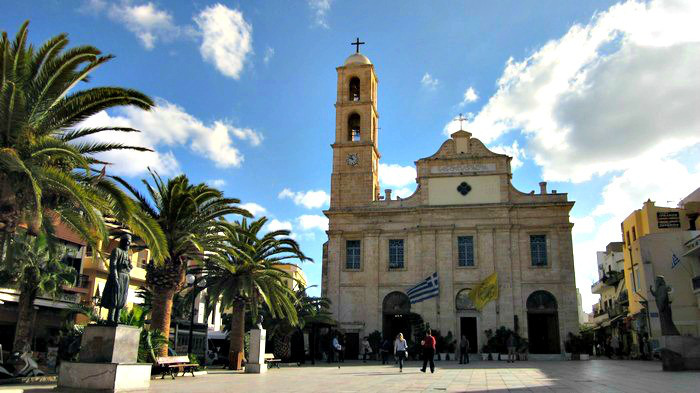 It is situated at Patriarchou Athinagora square off Halidon street. Your small group will be carefully lead through selected streets and alleyways to bring you to places that have been associated with Chania food specialties and delicacies for ages. Each food tasting location has been chosen with care on the basis not only of the quality and uniqueness of its products but also because of the passion of the people involved and the story of the place and area which it is located. Our aim is to offer you an unforgettable experience of the Real Chania, with your five senses like a local and not like a visitor which is why each tasting is combined with fascinating insights on food culture and local traditions as they have evolved through the centuries. So come and explore with us atmospheric Chania with the Chania Food Tour in the company of experienced and highly knowledgeable guides who know Chania like the back of their hands. Meet the people who have kept these wonderful food traditions alive and taste, taste, taste! Please meet your tour guide at 10:00 am at Trimartiri (also called "Mitropoli", the Orthodox Cathedral) on Patriarchou Athinagora square off Halidon street. Your tour guide will hold a Chania Walking Tours sign to identify him / her.